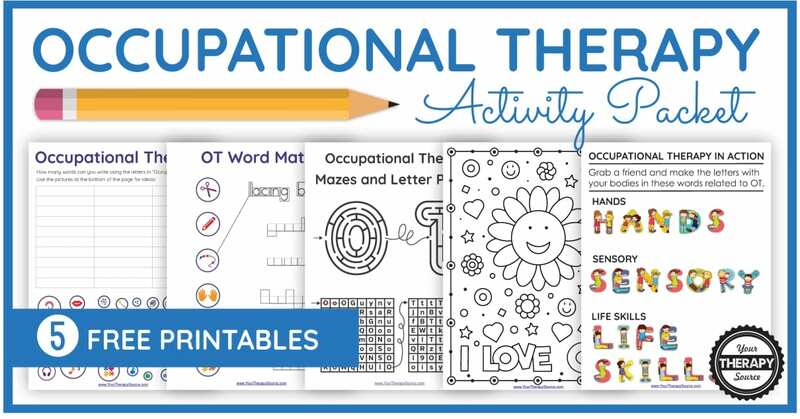 To celebrate OT month (or to celebrate Occupational Therapy anytime of year) we have a great FREE Occupational Therapy activity packet for you to download! This packet is loaded with fine motor skills, visual motor skills, handwriting and physical activity all related to Occupational Therapy. 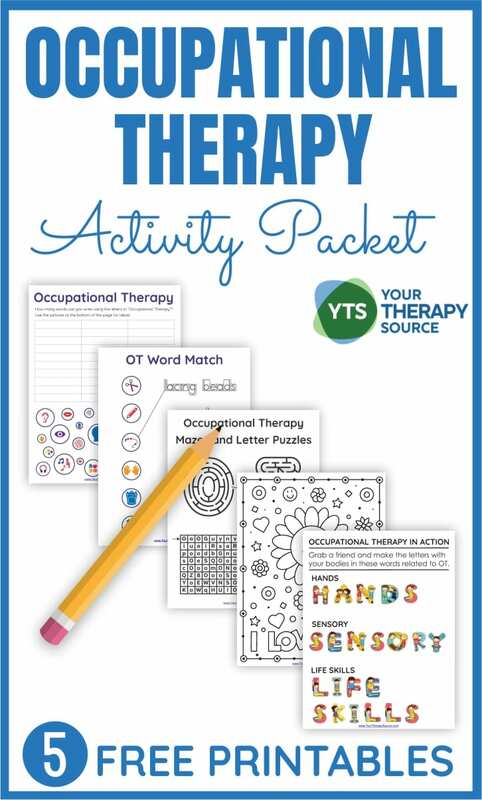 What is included in the FREE Occupational Therapy Activity Packet? Activity #1 is an Occupational Therapy word puzzle with picture icons to spark ideas. This activity encourages executive functioning skills and handwriting. Activity #2 is an Occupational Therapy Word Match puzzle to practice letter sizing, visual-spatial skills, and letter formation skills. Activity #3 includes OT mazes and OT letter maze paths to practice visual motor skills. Activity #4 is an I LOVE OT coloring page. How awesome would these look on a bulletin board anytime of year! Activity #5 is OT in Action. Grab a friend and practice body awareness, motor planning, and coordination skills. Host a coloring contest. Awards a prize (small gift card, sticker book, etc.) to the best I LOVE OT colored picture. Create an OT Month obstacle course with several stations. For example, start off with jumping along a path to get to station #1. Hang up Activity #1 on the wall. Set a timer for 30 seconds and see how many words the student can write down. Walk across a balance beam to station #2. Hang up activity #2 – the student has to solve the word match puzzle before continuing along the obstacle course. Continuing adding stations based on the skills the students need to work on. Host a Make and Take OT Session. Print out the activity packets. The students have to take one of each page, make hole punches on the left hand side, and lace yarn through it to create an OT take home activity packet. Send the OT activity packet with the student. They can complete it during free time at school or at home. Whoever brings it back completed gets a small prize to celebrate OT month. Team OT Month Game – Divide a group into two teams or more. Give each team the packet. The goal is to be the first team to complete all 5 pages. Provide one minute for the team to discuss who will complete what tasks. Everyone MUST participate in some way. On GO both teams work to complete each page of the packet. The first team to complete all 5 pages working together (without arguing) is the winner! 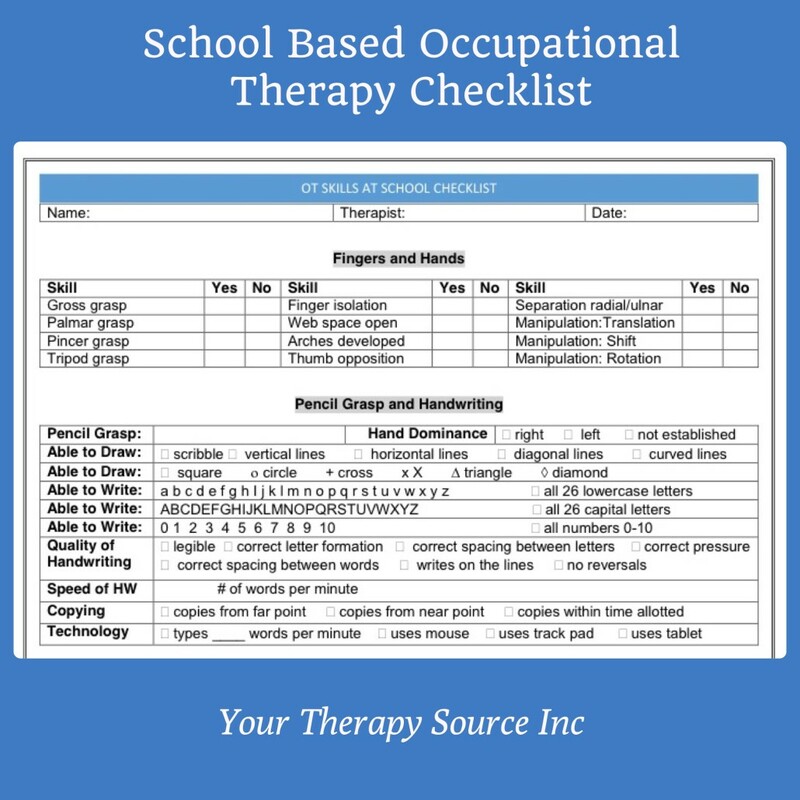 The School-Based Occupational Therapy Checklist screening form is an electronic document for pediatric occupational therapists in the school setting. Use this checklist to determine if a student is functional in the educational setting from an OT perspective. The checklist is divided into several categories: fingers and hands, pencil grasp and handwriting, classroom skills, life skills, visual perceptual skills, sensory processing skills, coordination skills, neuromuscular status, and environmental modifications. Get a clear picture of a child’s functional level in an educational setting all on just 2 pages! The Functional Evaluation of Fine Motor Skills is a clinical observation tool which precisely and comprehensively documents the many components of fine motor function. 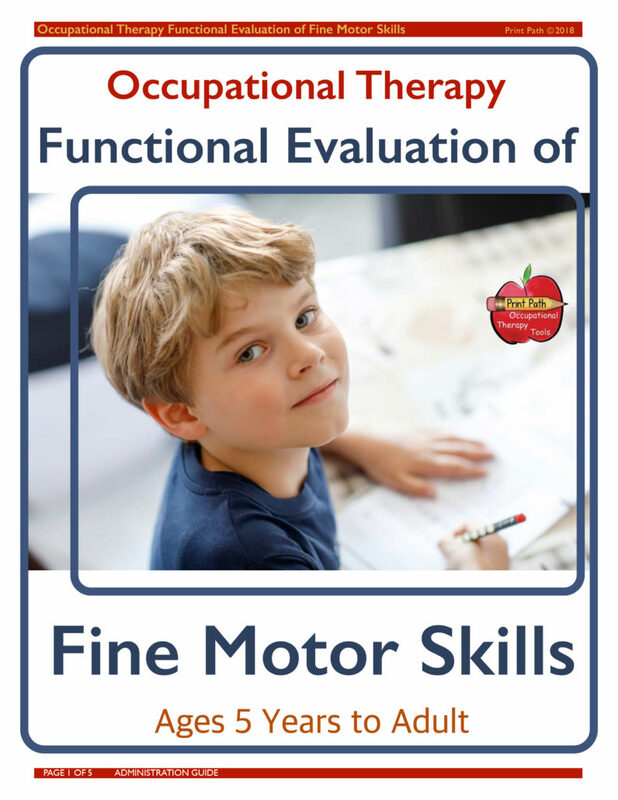 In order to optimize your clinical observations and clinical reasoning, and to pinpoint the underlying causes and distinct fine motor skill deficits that your client has, you can use the Functional Evaluation of Fine Motor Skills for individuals ages 5-year-old-to-Adult. Occupational Therapy Fine Motor Baselines can be used as a survey tool and a progress monitor tool. Occupational Therapy Fine Motor Baselines is appropriate for use with preschool-age students (ages 3-5) and older children with atypical development. This tool will help a licensed Occupational Therapist use appropriate developmental prompts, and efficiently document observations. Occupational Therapy Fine Motor Baselines can help the therapist document the level of assistance given for a child to accomplish tasks or measure the percentage of mastery. It will help the therapist prioritize treatment objectives and document growth. 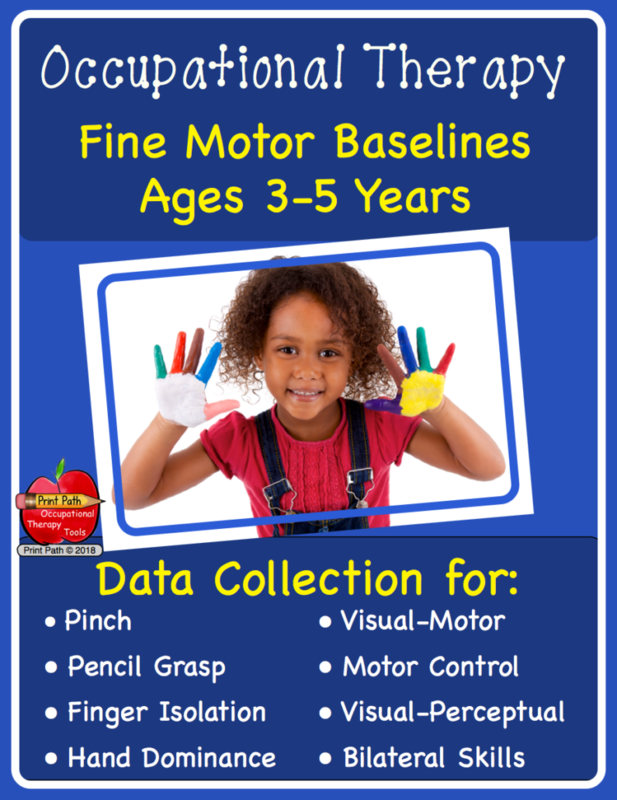 The Fine Motor Baselines cannot be used to provide age-referenced norms for an assessment. Sign up to receive the weekly email newsletter and other announcements from Your Therapy Source. You will be redirected to your download. If you can not view the sign up box send us and email and we will send you the freebie. Please reference this OT Activity Packet freebie you are looking to download.